If you’ve perused an airport bookshop in the past five years, or attended a women’s leadership course, you will be well aware of the Lean In phenomenon. The phrase was popularised by Facebook Chief Operating Officer Sheryl Sandberg, first in a TED Talk (2010) and then in her bestselling book (2013; co-written with Nell Scovell). Sheryl Sandberg’s message with Lean In is a fighting call to women in response to persistent workplace gender inequality. She urges us to face discrimination front-on – to overcome the ‘internal obstacles’ that hold us back from success, to ‘lean in’ to our careers, to ‘take a seat at the table’, and exhibit the ‘will to lead’. On a popular spin-off website there are top tips, books to purchase and a series of empowering memes – ‘If you’re offered a seat on a rocket you don’t ask what seat. You just get on’, and ‘Don’t wait for an epiphany. Go on a treasure hunt. Find opportunity’. We will argue that the Lean In phenomenon is, at the same time, both underrated and overrated. Underrated as a clear and convincing documentation of the continuing barriers that women face in the workplace, but overrated in terms of solutions for overcoming these barriers. The Lean In phenomenon runs the risk of being written off as a popular self-help book from a high-profile, successful woman. But the book does an excellent job of documenting the barriers that women continue to face in the workplace and the very different experiences women have compared with their male colleagues. Using clear anecdotes and examples, it provides a comprehensive review of the blatant discrimination and stereotypes that impact upon women, but also elucidates how subtle messages about gender roles can create pressure for women to behave in line with these exact stereotypes. The clarity of this documentation is crucial for tackling workplace inequality. Many instances of gender discrimination or inequality are ambiguous and subtle (e.g. Barreto et al., 2009), and research tells us that instances of discrimination are often difficult to identify as such (e.g. Swim et al., 2005). The Lean In phenomenon renders subtle discrimination easier to identify – if you will, it makes the ‘glass’ in the glass ceiling (or indeed the glass cliff) more opaque. It allows women to recognise their shared experience of inequality, and importantly, by encouraging the establishment of Lean In support circles, provides a mechanism by which women can commiserate and assist one another in addressing inequality. There is no doubt that Lean In provides an excellent description of the barriers faced by women as a group and, importantly, it kick starts a discussion about workplace inequality. Where we think it falls short is in the solutions that it offers to address this inequality. For all its empowerment and fighting talk, we feel that Lean In’s core message is that we should fix women – taking a seat at the table that is laid for men, getting on the rocketship designed by men for men. In short, it calls for women to adjust themselves to fit in within a very masculine environment. Despite acknowledging the external barriers to gender equality, the book instead proposes solutions to fix the internal barriers women apparently erect themselves. For example, the book suggests that it is women’s chronic lack of confidence that prevents them from taking a seat at the table. However, this narrative neglects the fact that external barriers are precisely what lead women to question themselves in the first place. We argue that internal and external barriers must be seen and treated as being inextricably linked. Tackling internal barriers in isolation of external barriers is unlikely to be productive for a number of reasons. It is like describing a swimming hole full of dangerous creatures – crocodiles, water snakes, leeches (pardon the metaphor here) – and then saying that people should just brace themselves, take the risk, and dive in, with little regard for what they will encounter when they do so. Both blatant and subtle societal messages discourage assertiveness and ambition in women. So while empowering women to step up to that rocketship may increase their motivation and desire to put themselves forward, it does little to prepare them for, or address, the very real consequences they will face when they push against these norms. Think of Hillary Clinton or any number of other powerful women who have been described as an old battle-axe, merely for being assertive – behaviour that is mundane for powerful men is perceived as threatening when enacted by a woman. Given the social repercussions women face for ‘leaning in’ (Rudman & Glick, 2001), the book’s solutions may be setting many women up to fail (unless they’re one of the magical unicorns who can manage to be assertive without being too threatening). Moreover, Lean In is a message of individual mobility – trying to equip individual women to adapt to the existing system by adopting the values and strategies endorsed by it. While this strategy may work for individual women, and often those women who are privileged in terms of their intersecting identities (white, highly educated, straight women), it does little to change the system itself. In this way, women as a group are unlikely to benefit from such an approach. The success of a token few is also unlikely to change stereotypes about gender or about leadership. The small number of successful women are likely to be subtyped (e.g. Eckes, 1994). Even if women manage to ‘lean in’ effectively, their conformity with masculine workplace norms reinforces the perception that being assertive and decisive is the only reasonable model of leadership in the workplace. It does nothing to challenge outdated ideas about what qualities define good leadership. We suggest that alternative solutions are needed, solutions that are empowering for women as a collective, rather than for women as individuals. Instead of suggesting that women adjust to the workplace, we suggest that workplaces need to change to become more hospitable places for women. If we want sustainable change – we must challenge the status quo, not adapt to it or replicate it. Barreto, M., Ryan, M.K. & Schmitt, M. (Eds.) (2009). 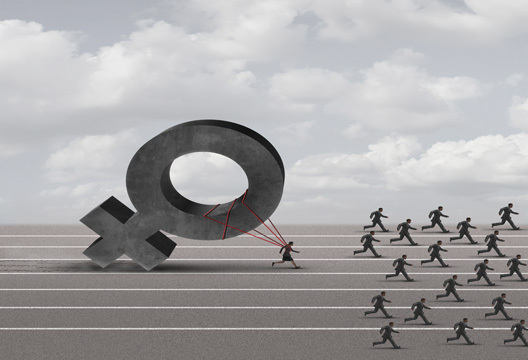 The glass ceiling in the 21st century: Understanding barriers to gender equality. APA Division 35 Book Series. Eckes, T. (1994). Explorations in gender cognition: Content and structure of female and male subtypes. Social Cognition, 12, 37–60. Rudman, L.A. & Glick, P. (2001). Prescriptive gender stereotypes and backlash toward agentic women. Journal of Social Issues, 57, 743–762. Sandberg, S. (2010). Why we have too few women leaders. Sandberg, S. (with Scovell, N.) (2013). Lean in: Women, work, and the will to lead. New York: Alfred A. Knopf. Swim, J.K., Mallett, R., Russo-Devosa, Y. & Stangor, C. (2005). Judgments of sexism: A comparison of the subtlety of sexism measures and sources of variability in judgments of sexism. Psychology of Women Quarterly, 29, 406–411.